One of the fun decisions for your wedding is what type of cake to choose from. At times it can be overwhelming because there are many choices. There are round cakes, square cakes, multi-tiered cakes, and cakes with fountains. Don’t forget you need to pick the flavor of cake. Cakes can come in marble, yellow, chocolate, red velvet, and that is just the beginning. Everybody looks forward to the cake! As your wedding venue in Colorado, we’d like to give you a couple of pieces of advice that might just help you make your decision. 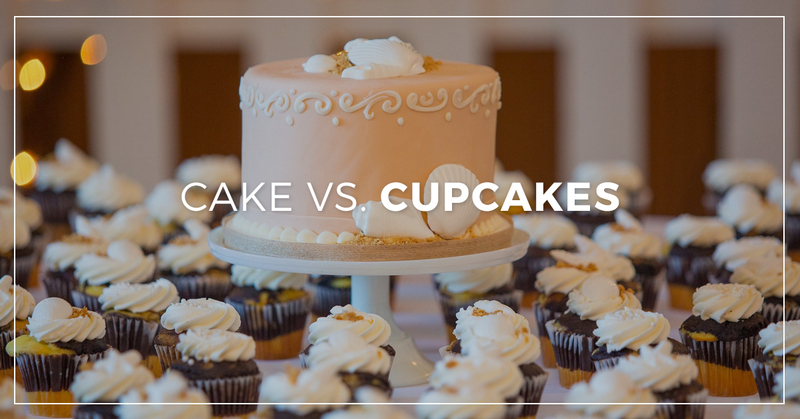 Recently there has been a debate between cupcakes vs. wedding cakes. Wedding cakes are more traditional, while cupcakes are becoming more of a modern touch. A wedding cake provides a visual element to your wedding. Tiers and cascading flowers can create a spectacular display. Cupcakes give you many choices as well, if not more. You could do 12 different flavors, fillings, colors, and more. Cupcakes can be decorated simply or lavishly. You can order mini or regular size. With either choice, just make sure that you have plates and silverware for your guests to use so that they can enjoy the dessert without messing up their formal attire! When deciding whether you want to use cupcakes or a wedding cake, remember that this is your special day and every decision is up to you! Pick what you love best! Knowing the theme of your wedding will make this decision easier. For me, this decision would be very easy! I would do both! I would have a traditional cake to cut into, but would also have a fun flavor display of cupcakes. Then you get the best of both worlds! There are no rules!! Just be sure to enjoy every second of your wedding day. You deserve it! At Church Ranch Event Center, we like to consider ourselves as more than just your wedding venue. We would like to help in any way that we can so that your big day is perfect! A few of our amenities include professional event coordinators to ensure that all of your needs and wishes are met, a wedding planner of your own to help ease your burden, and of course, a full bar! We will also provide you with a list of trusted vendors that we have used throughout the years. These vendors have been hand selected due to their high quality of products, as well as their commitment to exceeding your expectations. Once again, remember that our involvement is all up to you. If you have vendors that you would like to use or already have a personal wedding planner, that is a-okay! Every choice is yours! Our event venue is located just along the gorgeous Rocky Mountain Front Range in Colorado, and the combination of our gorgeous grounds, rustic event hall, and the incredible sound system will make ensure the perfect ceremony and reception. Whether you’re looking for an indoor wedding venue during the winter, or an outdoors celebration amongst beautiful trees, gardens, and water features, we’ve got it! If you’d like to learn more, or would like to set up a time to tour our facility, be sure to contact us today!